This is just one instance of how much Korean spies in Japan have been so far active in trying to topple Japan. Kim Giru Uku 金吉旭 is one of 11 Koreans now on the wanted list of Interpol, who abducted the Japanese nationals and took them to North Korea. It is even shocking to know that he worked as principal of the Korean school in Osaka, Japan and at the same time as a North Korean operative. The Korean schools established throughout Japan where students worship and glorify Kim Il Sung and Kim Jong Il as some kind of gods while stirring up anti-Japan sentiments in their minds in such a manner as to teach them distortions, fictions, exaggerations, etc. The photo is just one of the evidences showing that the Korean residents in Japan pursue the ideology prescribed by Kim Jong Il. The students attending those schools are taught to worship Kim Il Song and Kim John Il while benefiting from what Japan can offer economically. Those Korean residents refuse to attend schools in Japan although they are entitled to enjoy the equal rights as the Japanese nationals do. In fact, what they teach there is not based upon Fundamental Law of Education enacted in 1947. http://bit.ly/igO4dD However, the Kan administration has shown such a passion as to financially assist their schools with the taxes collected from the hardworking Japanese believing in democracy and free market economy. Suppose some terrorist groups establish their schools in the United States of America and teach everything against the U.S.A. I don't think any Americans will dare to support those schools unless they are also terrorists. 1. The Korean schools in Japan are administered by General Association of Korean Residents, one of the organs under the direct control of the Democratic People's Republic of Korea. The association has reportedly assumed its important responsibility for carrying out a series of abductions as evidenced in the case indicated above. 2. Teachers at those schools are not qualified to pursue teaching professions in Japan as far as the Japanese laws are concerned. Their curriculum is not based upon what the Japanese educational guidelines stipulate. 3. Any public spending to those schools violate Article 89 of the Constitution of Japan. 4. The Korean residents refuse to attend the Japanese schools even if nothing prevents them from enjoying a privilege of receiving the same education as the Japanese nationals do. 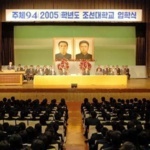 Note: The photo attached herein shows their commencement ceremony in which graduating students listen to school principal say with the photos of Kim Il Song and Kim John Il behind him. They worship daily Kim Il Song and Kim John Il even in their classrooms. The above has been written mostly based upon the Japanese tweets, blogs, etc.